Carl Lentz refuses to “own the moment” with his view on abortion. Home › Hillsong › Carl Lentz refuses to “own the moment” with his view on abortion. While Jesus declared He would build his church, Carl Lentz was on ‘The View’ building his church (cult) – with his brand, his name, his face, his clothes, his styling and now his book ‘Own The Moment’. So when a tough question was thrown at him challenging the foundation his church (cult) is built on, what answer should we expect? Cutting through Lentz’ grandstanding, Joy Behar asked him about Hillsong’s view on abortion with a very direct question requiring a yes or no answer. His response once again demonstrated that when the tough questions come their way, Hillsong leadership is completely incompetent – because their foundation is not on Christ and His clear teaching but their own ‘vain imagination’. Unfortunately, too many Christians continue to call this movement a church when it clearly is pushing its own cultish agenda, constructing a Jesus that only a secular world could love. And it’s only when challenged by true believers that Hillsong say something else (flip-flop) in order to appease their critics. Just like Hillsong leader Brian Houston, we are seeing the same rot emerging from Carl Lentz – leadership that has no foundation and fortitude in Christ but rather built on the vain egos of men. It seems the world can see through the facade of Carl Lentz and Hillsong but not the many thousands of Hillsong followers. Carl Lentz failing the abortion question is like an adult failing a five year old’s Sunday school question. Putting it bluntly, Hillsong is without excuse. Carl Lentz was a graduate of Hillsong Bible College and specifically chosen by Hillsong leadership to represent their brand in the USA. So the basic questions need to be asked. Why did Hillsong choose someone this theologically inept and incompetent as a pastor, to represent the Christian faith? Is Carl Lentz really the best they’ve got? Is this the best type of crop one can expect tp get from Hillsong bible college? 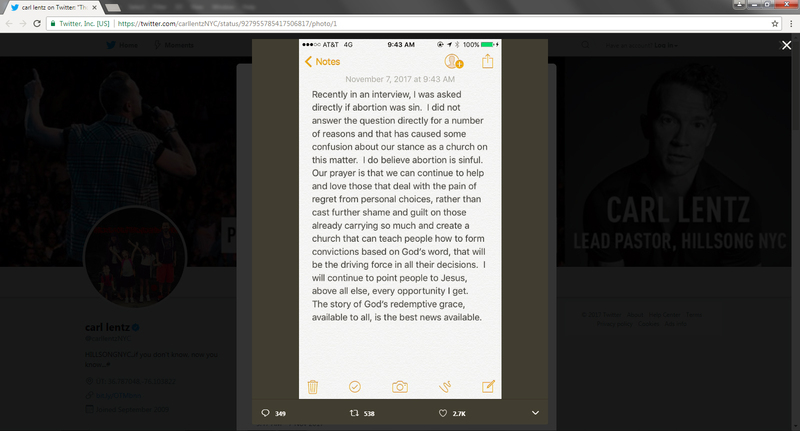 ‹ Hillsong’s Carl Lentz stance on abortion.